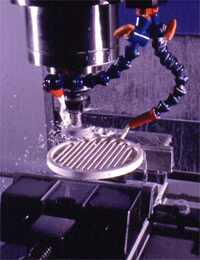 Machining speed and coolant are decisive for successful machining. MACOR® machinable glass ceramic can be processed with tools of high-speed steel To achieve a longer service life and better surface finishes, cemented carbide tools are recommended. It is advisable to use plenty of coolant.As with any new material, one should take time to get to know how MACOR® behaves during machining. The best results are achieved with the use of a water-soluble coolant ,especially formulated for cutting and grinding glass or ceramics. There is no needforpost-firingafter machining. When machining small or delicate workpieces, care should be taken to achieve uniform distribution of clamping load. Soft clamping jaws should be used if possible. It is advisable to use a carbide grit blade at aband speed of 30.5 m/min (100 fpm). A silicon carbide or diamond cut-off wheel can be used as an alternative. The drill feed rate should be chosen to suit the hole diameter and MACOR® workpiece thickness. For break-out, at least 0.13 cm (0.05 in) extra material should be provided on the reverse. This excess material can be removed after drilling. The clearance/pilot holes should be 0.2 – 0.3 mm larger than those recommended for metals. Chamfer both ends of the hole to prevent chipping. Run the tap in one direction only, as forward and reverse turning of the tap can cause chipping. Constant rinsing with water and coolant removes chips and dust from the tap. Diamond, silicon carbide or aluminium oxide grinding wheels can be used. HOME with loose 400-grit silicon carbide on a steel wheel. For the final polish, use cerium dioxide or alumina on a buffing wheel for glass or ceramics. A 0.013 µm (0.5 µin) finish can be achieved.